Traditional marketing methods like television and radio distribute messages in a way that is like shouting across a crowd. Today’s “new school” web marketing is less of a shout and more of a private conversation. 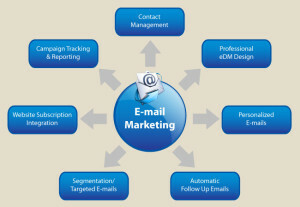 E-mail marketing, one of web marketing’s most powerful channels, taps both mass marketing and niche targeting power, depending on the application. E-mail marketing allows senders to broadcast a marketing message to appeal to the widest swath of audience, fi ne-tune it to a specific user based on their previous behaviors or purchases (“Since you bought X, why not try Z?”). It allows senders to track user behavior such as who opened an e-mail and who didn’t, which links got clicked on and which did not. E-mail marketing is so effective because it connects you with potential clients in a place that they check constantly—their inbox. Used correctly, e-mail marketing can move prospects down the sales funnel automatically. E-mail marketing can also offer tremendous value to recipients, bringing convenient, easy, value-added content and information that’s customized to their exact needs. E-mail marketing can drive sales through special offers or coupons that are targeted to users’ stated interests or past purchases. E-mail marketing not only makes it easy to follow a client through product, service, buying, and seasonal cycles, but through the cycles of life (as they get married, have babies, send their kids to school, and so on). Because so many people suffer from media overload, e-mail marketing can be a challenge for marketers to implement successfully. Really, who needs more messages in their inbox? However, when done strategically, e-mail marketing can be extremely rewarding for both the sender and recipient. Despite the new social media age, e-mail marketing is still a quick and cost-effective way to reach out to target audiences. All too often talented professionals, with outstanding services to offer, are not approaching their e-mail campaigns with critical thought and execution. E-mail marketing is one of online marketing’s most elegant and effective channels, yet it has earned a rough reputation due to its evil twin—spam. As social media marketing continues to gain strength, sometimes professionals forget about the tremendous power e-mail has. People use e-mail for work and play. If marketers can capture attention in a place most people spend daily time, then e-mail can become a very sustainable part of overall web marketing. The next steps for e-mail marketing are to understand who your audience includes and brainstorm content that will be of interest to them. Incorporate ways to build the e-mail list, manage the list, segment it, test it, and track it. Don’t forget that an e-mail signature can be an easy way to boost traffic to your site, build awareness, and promote new offers. Set up an e-mail signature with a purpose. Use that valuable real estate to connect with the people you already converse with. E-mail is a great information distribution medium for facts, reports, statistics, quick notes, and news. E-mail is a way to pass information, share information, and receive information. Productive professionals who use multiple communication mediums will always win at the web marketing game. E-mail is not going away any time soon. Be sure to think about ways to create, optimize, and try new communications via e-mail.